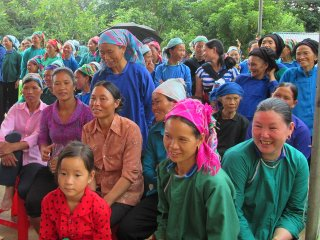 After the 2 hour journey by motorbike, I finally reached Nam Lu Commune following an invitation from Hai, the Vice Chairman of the commune. Here the sunshine is brilliant and birds are singing. Today is the traditional festival which is celebrated on the first days of Lunar July. I heard the voices of young girls, mothers, and elderly ladies. They are all in traditional clothes, on their way to the People’s Committee where the festival is celebrated and chatting about the day. As they walk they tease each other and laugh out loud happily. This must be a very special festival to them. In the festival itself there are a lot of activities, such as art performances, traditional games, and fashion shows. 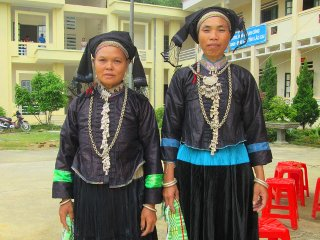 Songs and plays in the Nung language are performed by both young and old people in the commune. Although I don’t understand their language, seeing the villagers of different ages singing along with the performers and swaying while following the rhymes, I know the songs are beautiful and they love them. One of the most interesting parts of the festival was the fashion show, with the performance of young Nung ladies in their traditional clothing. They are not gaudy or colorful but Nung women are still very charming in them. Nung Di people in their casual clothes. Traditional foods are sold in small camps so that people can enjoy the performances and local specialties at the same time. I was so impressed by the seven-color steam sticky rice. Can you believe that Nung people can make all seven colors– from black, yellow, purple to blue, gray, red and orange– from only one ingredient, a kind of local herb? It is called the magenta plant, or chẩm thủ by Nung people. They also make pink chopsticks by dying them in the liquid made from this plants leaves. It’s so incredible. The local people here tell me that in traditional festivals like this one, every family in the commune makes seven-color steam sticky rice and pink chopsticks, with the hope that good luck and happiness will find them in the future. Does your family have any traditional dishes that you serve at certain times of year and prepare in special ways? Share with us how you celebrate!